GreatWorks started out as the educational programming arm of Irish Repertory of Chicago. In 2006, Irish Rep spun off GreatWorks as a standalone company, with Matt O'Brien (bio) moving from being Artistic Director of Irish Rep to taking on GreatWorks as our full-time Producing Director. 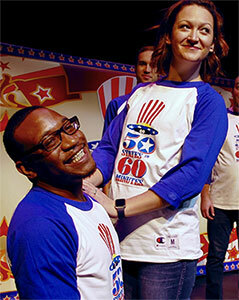 In the years since, GreatWorks has grown to include a lineup of 13 social studies and literature-based touring shows. GreatWorks' audience for 2017/18 was upwards of 45,000 students, making us one of the most-seen theaters for young audiences in the midwest. Our goal is to make your students' experience a good theatrical experience as well as an educational event. Every show has multiple layers of humor and meaning written into them, so that everyone watching - student and teacher alike - is getting something unique and personal out of the production. The shows are performed by some of the best directing and acting talent in Chicago, artists who bring the same level of commitment and theatrical quality to your school as they do in their "night jobs" in Chicago's busy professional theatres. We're based in Chicago, but regularly travel to regional bookings in Iowa, Michigan, Indiana, and Wisconsin as well as throughout our home state, and we're always eager to expand our circle of venues, so please don't hesitate to call for a quote. Locations further than 50 miles from Chicago require a small additional fee to cover travel expenses and the additional travel time. Do We License our Scripts for other Productions? Sometimes, yes. If you're interested in talking to us about CHRISTMAS CAROL, 50 STATES IN 60 MINUTES, THE MONEY SHOW!, FRACTURED FAIRY TALES, or ANNE FRANK, please contact Matt O'Brien with details of your proposed production.